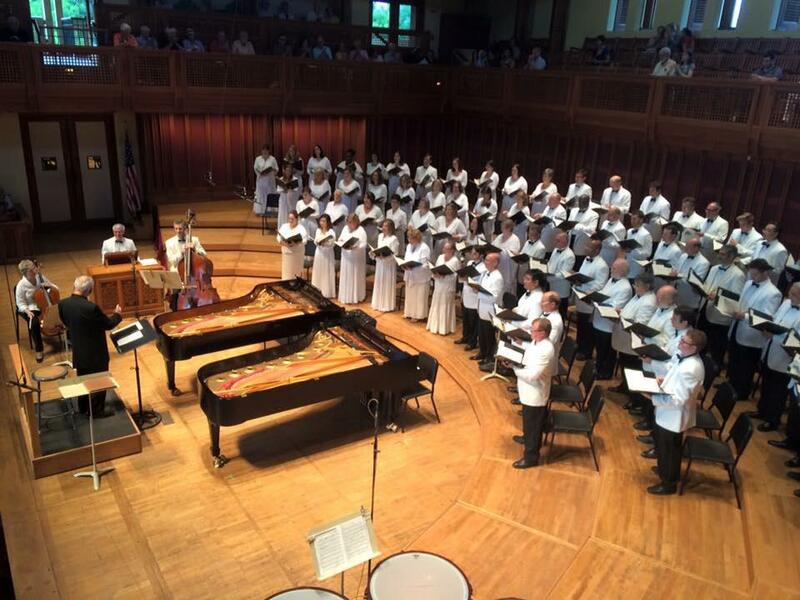 On Friday, John Oliver conducted his final prelude concert as the leader of the Tanglewood Festival Chorus before his retirement. The next to last piece on the program, Copland’s “The Promise of Living,” was the perfect tear-jerking valediction that pretty much summed up our time with John over the last 45+ years. Friday’s performance was masterful and powerful, even with the normal orchestral accompaniment reduced to two pianos. Frank Corliss, our former rehearsal pianist, even made a cameo as he joined current pianist Martin Amlin. (I half-expected Phyllis Curtin, Seiji Ozawa, and James Levine to walk out at the end as a sort of “This Is Your Life” surprise movie ending for John.) The moving music coupled with it being John’s performance meant some singers were fighting through tears while singing; in fact, many of us chorus members not in the prelude concert were dabbing our eyes as well. You might call the piece John’s personal creed. John has made it known in rehearsals before that he’s not particularly religious, but that he still relies on his sense of wonder about the world — especially when he needs us to convey that wonder in pieces that touch on the divine. To some degree, you can’t sing great choral works, born out of their composers’ faith, without reaching inward and touching one’s own connection to Something Greater Than Us. In this great Huffington Post interview with Michael Levin, John reflects on how his spirituality and emotional nature helps him connect to music. So to some degree, “The Promise of Living” feels like John’s parting advice to us. Just as one of his other favorite pieces, the Brahms Requiem, is decidedly sacred but shrugs off any particular liturgical setting in favor of a more secular humanism, Copland’s work, capturing the vernacular of the Midwestern American spirit, echoes a faith in relying on those living with us now over any supernatural intervention. In essence: our lives are made better by loving each other, looking out for each other, and sharing the work between us – and that is the path to “peace in our own hearts, and peace with our neighbor.” As the chorus itself faces uncertainty, staring into a future sure to bring changes through the leadership transition, John reminds us to “keep planting each row with seeds of grain,” and Providence will take care of the rest. I’d even go so far as to say that this song is the Tanglewood Festival Chorus’s personal creed — if it were possible for an entire organization to hold a belief. “For many a year [we’ve] known these fields” of the greens of the Tanglewood lawn. And we “know all the work that makes them yield” the music that we spend countless hours memorizing and internalizing separately, so that when we come together for a residency, “ready to lend a hand,” we can work together to “bring in the blessings of harvest.” Sunshine or rain, we bring in the grain of another successful performance — and we do it together through a shared purpose that transcends any social cliques that form here and there while we enjoy our time out in the Berkshires. When we’re on a stage together, whether it be Symphony Hall, Ozawa Hall, or the Koussevitzky Shed, we do so with the promise that sharing our hard labor and connecting personally with each other, with John, with the composer’s soul, and whoever’s conducting, will create a whole that’s greater than the sum of its parts. So “let us sing our song, and let our song be heard. Let’s sing our song with our hearts, and find a promise in that song.” The Joy (Freude!) of Beethoven’s Ninth may be what the TFC is most known for, having performed it almost every summer for the last four decades. But in our hearts, that Joy comes from what John Oliver has indelibly stamped on our characters. The promise of living — the promise of singing — is the opportunity to continue working together as a community to create great music. Nothing will ever change that. This Saturday we are singing a very emotional, almost melodramatic piece: Verdi’s Stabat Mater. To plumb the depths of its rich emotional content, I’ve found, requires a combination of individual effort and a unifying vision by our conductors. Regardless of your religious upbringing, there’s something fundamentally primal about the scene set forth: Mary standing beside Jesus’s cross as he dies. Everyone has been a son/daughter, and many of us are either parents ourselves or have taken care of someone we love. We know the fear, the anguish, of a loved one suffering and not being able to do anything to prevent it. Singing is about communicating. And so each of us in the chorus has to find that dark place within us, that fear and anguish – as well as the longing and hope for an end to that suffering through salvation – and tap into those emotions enough to bring it out in the notes we sing. You’d think it wouldn’t matter: a C-sharp is a C-sharp is a C-sharp, right? Wrong. The difference in emotional context is noticeable even to an untrained ear. But 120 individual connections to the music doesn’t give us a unified sound. That’s where John Oliver and Bramwell Tovey come in. They use metaphors and describe situations to bring our interpretations together. Let me cite some examples. The very first note of the piece is this strong dissonant C-sharp leading tone in unison. It’s a forceful entrance that also has to double as that powerful initial outpouring of a mother’s grief. As we sing about Jesus – her sweet son, dying, abandoned, his last breath escaping – Tovey asked for a quieter and more mournful sound. “Who would ever want to be a mother,” he commented, after rehearsing that package. The end of the piece is us pleading that when our bodies die, we ask to be granted passage into heaven (paradisi gloria). We first sang it a little too happy; “when our bodies die, yay!” But besides correcting that, Maestro Tovey asked us to sing it as if we weren’t sure we were gonna make it. The result is this trembling, doubtful unspoken question hanging over the hesitating request for salvation, followed by a glorious representation of heaven in the finale. Strings and brass blare as we crescendo, literally ascending to musical heights. This morning he did one better, asking us to observe the triple-piano at the beginning of the ascension to heaven. The result is this truly magical moment, right after the trepidatious prayer, where it just feels like the whole world is glittering with sunlight in the morning. It’s the transformational moment when The Beast becomes the prince, when Excalibur comes out of the stone, when Dorothy clicks her heels and goes home. It’s the ultimate reveal. Today, it was announced (officially and publicly) that John Oliver, founder and sole conductor of the Tanglewood Festival Chorus for 45 years, was stepping down from his leadership position at the end of the 2015 Tanglewood season. We knew it would happen someday, even if we don’t know why it’s now. The lure of his greenhouse gardens? The tough commutes to Boston and the Berkshires? A break to write his memoirs? A need for the next chapter? It’s not like he’s dying or quitting making music (which, for Maestro Frühbeck de Burgos were equivalent); he and his white pants will continue to be a strong presence out at Tanglewood with his Master Teacher Chair position, and I’m sure as “Conductor Laureate of the TFC” he’ll appear again in our Symphony Hall rehearsal room to over the ensuing years. But it’s the end of an era — his era. Conductors, choristers, orchestra members, and critics will undoubtedly praise his musicianship, his talent, his longevity, and the long-lasting effect he’s had on the Boston vocal music scene. But let me tell you what John Oliver means to me. From age 5 to 17, my private piano teacher (hi, Mrs. Sori!) was my musical lens, and in some ways, a life coach. She not only tapped into my musical talents, but instilled in me perseverance, the work ethics of practice, and the joys of performance. She encouraged my positive outlook. She taught me about trusting the talents you were given, and giving back to the world by celebrating them. When I left her behind and pursued a music minor in college, my musical world broadened. But for a year, I had no musical guidance — no North Star — beyond brief inspirations from professors teaching us the intricacies of harmony and counterpoint, music history, composing… and choral music, through a weekly sight singing lab. On a whim in 1991, I joined the MIT Concert Choir (as a course for credit), which John Oliver conducted. And John, whether he knew it or not, became my new musical North Star. I knew nothing of choral singing before that class, but walked out of college 4 years later having sung masses and requiems and symphonies and tone poems by Mozart, Stravinsky, Beethoven, Brahms, Verdi, Mendelssohn, and others. I was hooked. It’s because of that experience that, after graduating in February 1996, I hopped in and out of local choruses and grabbed a few “rent-a-bass” pickup chorus gigs, because I had developed such a love of singing and choral music. And, to my chagrin, I began to further appreciate John’s approach as a conductor, by not having it in my life any more. I started to see how his instincts, musical interpretations, and technical corrections (simple example: his definitive “eighths out” for rests to line up our cutoffs and increase the intelligibility of the text) really fixed a lot of choral problems that other groups and conductors were struggling to solve. In 1998 I found out that John Oliver conducted the Tanglewood Festival Chorus. So I auditioned, and was fortunate enough to get on the Pops-only roster. Then he invited me to join a couple summer concert rosters, including the prelude concert that year. “Tanglewood… what’s that? Where is it?” I asked. Needless to say, I was hooked again. I had my musical North Star back, moreso than ever before. That’s because the TFC was continually molded by John into what he wanted from a chorus. Those instincts and interpretations that made so much sense to me were now infused into this collective group, and blossomed in every rehearsal and performance. His focus on internalizing the music jived with my ability to memorize. The drudgery of weekly note practices from community choruses was replaced with opportunities to go deeper into what the music was communicating. Our musical flexibility increased as we learned to adapt his approaches to that week’s conductor’s vision. Our musical intelligence grew from his master classes, mental visualizations, and other singing advice he doled out (in between jokes, of course) during his time with us. It got me further than I could ever afford to travel via $50-$100/hr voice lessons. In a sense, most of what I love about my life has been possible thanks to John being part of my life. That’s because in 2000, I met my future wife in the chorus. That December I proposed to her on stage during a Pops concert. If I hadn’t learned to sing with John, and been part of his chorus, I probably would have never met her, and grown this wonderful family. In the early 2000s, John kicked me down from the regular performance roster back to the Pops-only roster. After two failed auditions to get back on the regular roster, John explained: “Your musical intelligence is fine, but you don’t know how to produce sound correctly. I can’t use you until you learn to use your instrument. Take some private voice lessons, then come back.” Humbled, I did as he asked, and discovered that I was Doing It All Wrong(TM). When I returned triumphantly with my newly discovered voice, John nodded and put me right back on the roster. Without that kick in the pants, I would have lumbered along with my “tired back-pew-of-the-church singer” voice and never challenged my level. Oh, I’ll never be one of the best 30-60 core singers in the group who sing prelude concerts; I’m not investing in my voice like the harder working, more dedicated career musicians in the chorus are doing. He’s continued to be that teacher, for all of us. He doesn’t push us, so much as the weight of his expectations and our desire to achieve those high levels of musicianship push us — and that’s part of the culture he’s created. I’ve been incredibly blessed with the opportunity to make music with him for the last 20-25 years… and to do it the way I’ve learned to make music… the way I’ll now always make music. There are chorus members who can also call themselves personal friends with John. I am not one of them. I’ve never joined his table at Brasserie Jo, or sat with him at our Tent Club after parties. But you know what? That’s totally fine. You never really want to be too close to your teachers, or they lose that authority and a little bit of that mystique. We’re not strangers by any means: he’s complimented me on my newsletter articles, I’ve shared a few jokes and observations with him in hallway conversations, and I’m quite confident that his ear and intimate knowledge of his singers means he can pick my individual voice out of a chorus of 20 basses. He may not have truly appreciated how he’s affected my musical life, let alone the lives of the thousands of choristers he’s coached, urged, pleaded, harangued, inspired, critiqued, and goaded until he got the sound he was looking for. But he has. I’ve sat at John’s musical side and basked in his tutelage since 1991; others, even longer. There will be other stars to navigate by, but none will shine as bright in my musical life as John Oliver has. We all wish him the best. Ahhhhh. That hit the spot. Thursday evening’s Brahms Requiem was possibly one of our more emotionally fulfilling performances of the piece. Personally, I felt very connected, in many ways. I felt connected to my body. My diaphragm and the “front porch” of my mouth and lips and arches were linked up, so I could generate and support the volume of sound I needed. I was struggling in rehearsals to find that connection and it meant a breathy, unsupported sound. I agree whole-heartedly with other choristers who suggested that we had a lot of people trying to save their voices in rehearsals, which may have accounted for the uneven sound then. It felt good to not hold back. I felt connected to the rest of the chorus, who came through brilliantly in all the tough parts that bedeviled us in rehearsals. Sopranos and tenors soared through those tough high passages. Altos were the solid foundation. We basses found levels of expressiveness I didn’t know we had. Even exiled in the upper back corner of the stage, I had no trouble feeling like I was part of every line. I felt connected to the emotional message of the piece. I found it easy to slip into the roles of comforter, doom-foreteller, patience-counselor, awestruck heaven-gazer, and nose-thumber — you don’t get to taunt Death too often, after all. With the emotional backdrop of the recent tragic death of a chorister’s sister, I think we all had something to sing for, and someone to comfort. Lastly, I felt connected to the audience. One woman in the front balcony, who clearly knew and loved the piece, was practically slapping her hand on the railing in time to the fast section in the 6th movement. And the moment after the piece was over was amazing. Tovey kept his hands up long after the last notes had died down, and the audience held their applause, not wanting to break the spell. Was this a technically sound performance? I think any performance will have its share of mistakes. I know I messed up a few words, and I heard a few folks talking about blown or unintentional entrances here and there. And our diction will never be as crisp as it was with Dohnányi. But that was never the point. We needed to connect with the music, with the audience, and with each other, and we succeeded. We’ve had our final rehearsal. The orchestra is in prime form, the conductor is beaming, the soloists are amazing. Is our normally solid chorus the weak link? I say that because this does not feel like it will be our best concert performance of the Brahms Requiem. To be fair, we’ve had some pretty awesome Brahms Requiem performances in the past several years, so the bar is set ridiculously high. But it’d be a damn shame if we wasted this opportunity, given we’re joined by the talented Bryn Terfel, the chorus-favorite conductor Bramwell Tovey, and the less well-known-but-equally-capable Rosemary Joshua. Tovey has been everything we’ve hoped: gracious, funny, clear in his adjustments and requests, and inspiring. He’s reminded us that lugubrious faces do not communicate how lovely thy dwelling place is, and that concentrated frowns don’t give credence to a message of everlasting joy. He’s one of those conductors that spends more time looking up at us than at the orchestra — breathing with us, smiling at us, encouraging us to keep locked in on his direction so he can take us where we want to go. And we so want to go with him! Yet, despite Bill Cutter’s efforts to prepare us — drilling us on diction and sound quality all week — there’s a collective concern that as a chorus we’re falling short of our normal levels of awesome. More than a few choristers I’ve chatted with are disappointed with the consistency of our sound. It’s not as full, not as supported, not as articulate and crisp, and not as emotionally invested as we’ve sung in the past. Sheesh, we still have Maestro Tovey correcting us for flat notes and intonation problems in the final orchestra rehearsal. If we can’t get past the compulsories, we’ll never transcend the notes to reach the deeper meaning of the piece. It shouldn’t be surprising that our rehearsals would be challenging. We no doubt worked too hard on Saturday and Sunday and burned us out for the rehearsals earlier this week. The rain and schedule has made it tough for many to attend rehearsals, leaving a preponderance of empty spots. Furthermore, this is an exhausting piece to sing! A tired chorus makes for an unsupported sound. Even trying to “mark” (sing softer), I’ve still left some rehearsals with a sore jaw from all the work required to sing this piece — I’m probably too tense with my singing, but I’ve heard similar complaints from a few other choristers about the physical stamina required to sing this piece. One thing making this even harder to correct is the insidious nature of any group collaboration. It’s easy to pick out what sounds wrong, and easy to assign blame, but harder to identify who or what is actually responsible. Worse, I doubt any of us truly recognize how we ourselves might be contributing to the problem. For instance, I might think the tenors and sopranos are having trouble singing through some of the higher notes (Tovey: “Just bring that high A up a little higher; don’t worry, it’ll never be sharp”). But I thought the basses were doing fine, only to hear from a few others that they thought we collectively sounded thin and unsupported in many passages. Oops. You never think you’re the problem. It’s humbling to realize that I might be one of the problems. So instead of brushing off that feedback, I personally need to ask myself: what can I do to better support my sound? To sing ‘operatically’ and get the full resonance I need to propel my notes to the back of the hall? To make my diction fortissimo? To maintain my breath control? To fully engage with this piece, and dedicate myself completely to it at the downbeat? Individually we’re singing with confidence, but I wonder if we might each be overconfident in our own abilities, and not considering the possibility that there’s more that we should be doing? Few people appreciate it when individual choristers speak up to say “I think that ‘we’ [meaning everyone but me, since I’m so smart that I’m pointing it out] are having trouble with this passage / diction / cut-off / note.” Yet hopefully, by performance time, we’ll all come to that realization that we each still have more to give. Tonight will be the first time that we are all physically present, and all mentally present, and have the opportunity to be emotionally present. It’s our chance to give it our all. To invest fully in the almost mystical qualities that embody this piece. I’m betting that we pull it off – we almost always do! “How many of you have sung this more than 10 times before?” asked our assistant conductor Bill Cutter in the middle of our second weekend rehearsal. A good 30+ hands shot up of the hundred or so choristers assembled. “And that’s the problem,” Bill said with a grimace. He admonished us (correctly) that too many of us were mailing it in, and not seeking that deep connection we need to have with the music. Bill did an admirable job not letting us sit back on our haunches and forced us to reconnect with the text and the meaning behind it. We needed a little flexibility, because Bill’s direction didn’t always match what the grizzled veterans were used to for this piece. That’s going to be incredibly important, because every performance of the Brahms is very different. And we don’t really know what to expect heading into Monday night’s piano rehearsal with Maestro Tovey. Come performance time, Maestro Tovey continued his outstanding leadership at the podium. He was animated, demonstrative, and inviting in his conducting. At no time did the chorus really feel we were competing with the orchestra’s sound, with Tovey holding the reins. Through it all, we successfully captured and conveyed the piece’s character and intensity. It’s hard to imagine the happy-go-lucky, musical showmanship of Tovey applied to a Requiem. But this isn’t a sad Requiem… it’s a celebration of the living. It’s a service for the living, not the deceased. It’s victory and power and mocking death’s inability to triumph in the end. It’s reflective peacefulness and the blessings of your friends and family that let you keep carrying on. So I fully expect Maestro Tovey to take us on quite a journey. Where Maestro Dohnányi was about philosophy and precision, Tovey will almost certainly be about color and emotion. Though they’ll both share the same directive: to rejoice in our lives even as we comfort the mourners.